Jarrad completed his tertiary education at Bond University on the Gold Coast. Firstly, attaining a Bachelor of Exercise Science (BExSc) qualification prior to the successful completion of the Doctor of Physiotherapy (DPhty) program. He has two years experience in the acute hospital and rehabilitation setting with a specific interest in the assessment and management of orthopaedic and neurosurgical inpatients. 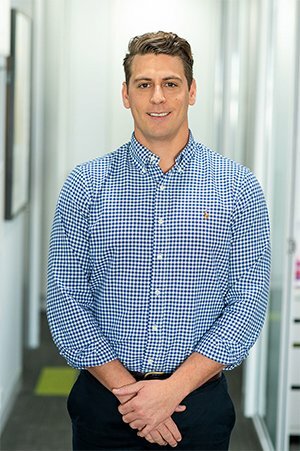 With a keen interest in sports, Jarrad has worked extensively as a physiotherapist with the Gold Coast Titans Rugby League Club, Australian U20s Rugby Union Team and Northern Sydney Rays in the National Rugby Championship. Jarrad’s treatment encompasses a firm hands on approach combined with home exercise program designed specifically to eliminate your pain on a long-term basis and correct any predisposing/contributing factors. In his spare time Jarrad enjoys surfing, swimming, travelling and spending time with friends.